WELLFLEET — Pity the poor drama critic: damned as namby-pamby if he/she routinely plays nice, despised by theater practitioners — but beloved of controversy-courting publications — if gifted in the art of the putdown. 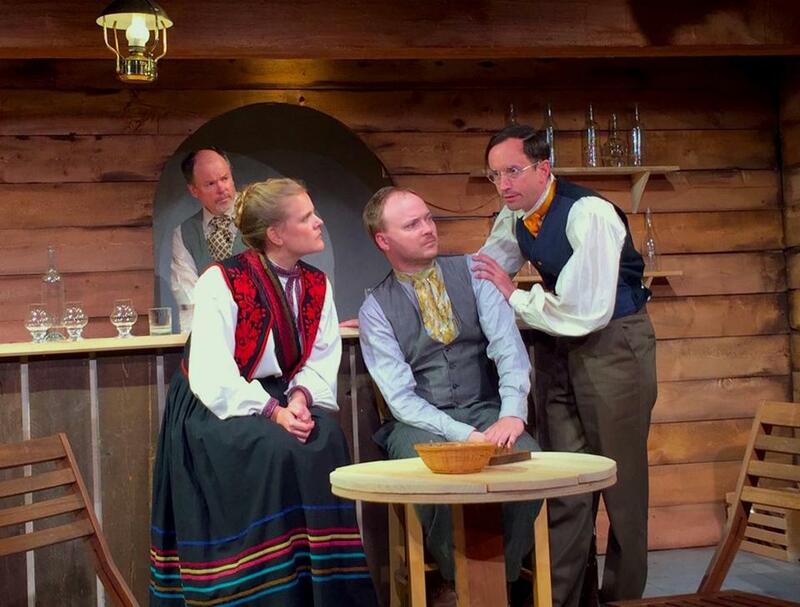 Harbor Stage cofounder Brenda Withers, of “Matt & Ben” acclaim, has clearly been brushing up on her Chekhov (colleague Robert Kropf has written a couple of brilliant adaptations for the company since its founding in 2012). Her wholly imagined “faux-period piece” — per the press release — is not so much a straight-on parody as a sly, appreciative homage. Surely Lexi — who sweeps grandly into the bar with her coterie — has an antecedent in Irina Arkadina, the egotistical diva who carelessly foments such distress in “The Seagull.” This particular tin-pot thespian enjoys the fawning of two adoring acolytes. Stas (hulking Robin Bloodworth, playing earnest and dim) is a former nobody whom Lexi prizes for being “big-hearted” (“So big . . . have I already said hearted?” she purrs, draping herself over her find for the benefit of her still-besotted ex-spouse). Stas, inspired, segues into a Nina-esque paean to the thrills of the acting profession. “Is tonight not the very first night you have ever stepped onto a stage?” counters Lili, a pragmatic barmaid played with crack comic timing by company newcomer Holly Erin McCarthy. Shrand, a rabid town-booster (Withers has perhaps had some dealings with local tourism boards), is initially aghast at the prospect of a negative review. However, she and the Abliveta Tribuna Express’s self-important senior editor (David Nelson) rapidly change their tune once they perceive the potential for a flame war. For Alexandra Alexandrovna, well-deserved ridicule; for Brenda Withers, kudos once again. Oh, and that pistol mounted prominently on the barroom wall? There it will rebelliously remain.